Love the detailed shot of Tamera’s pants! 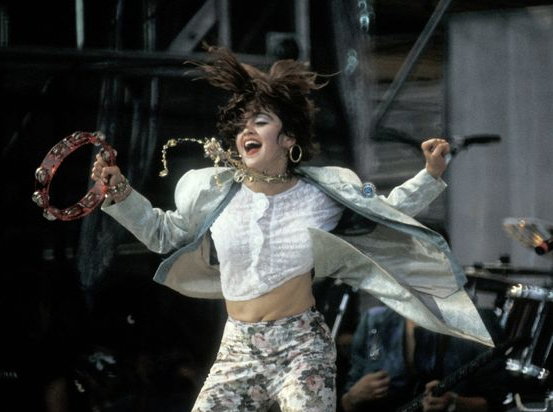 Madonna getting into the groove at Live Aid, July 1985. Getty Photo. Susan of Une femme d’un certain âge. Michelle of Retro Chic Mama. Rosemary of Distinctly Southern Style. 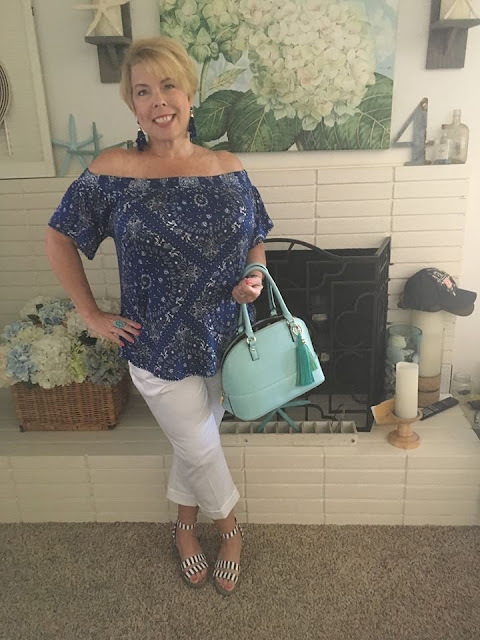 Dianne of Lighthearted Life combines a print off-the-shoulder top with white cropped pants and a fun pair of striped sandals. 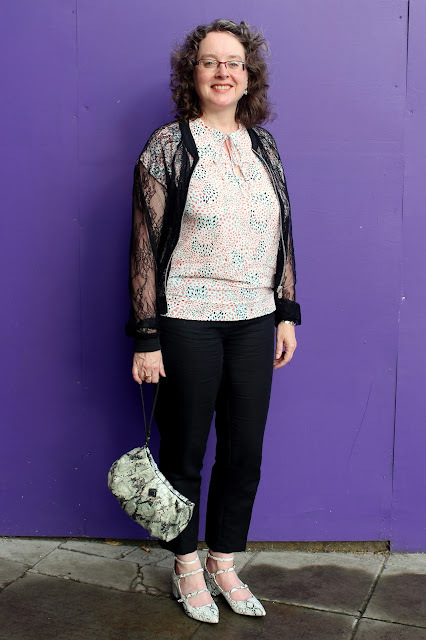 She completed the look with bold blue earrings and a ladylike pastel-colored bag. Crystal of Success in Heels. 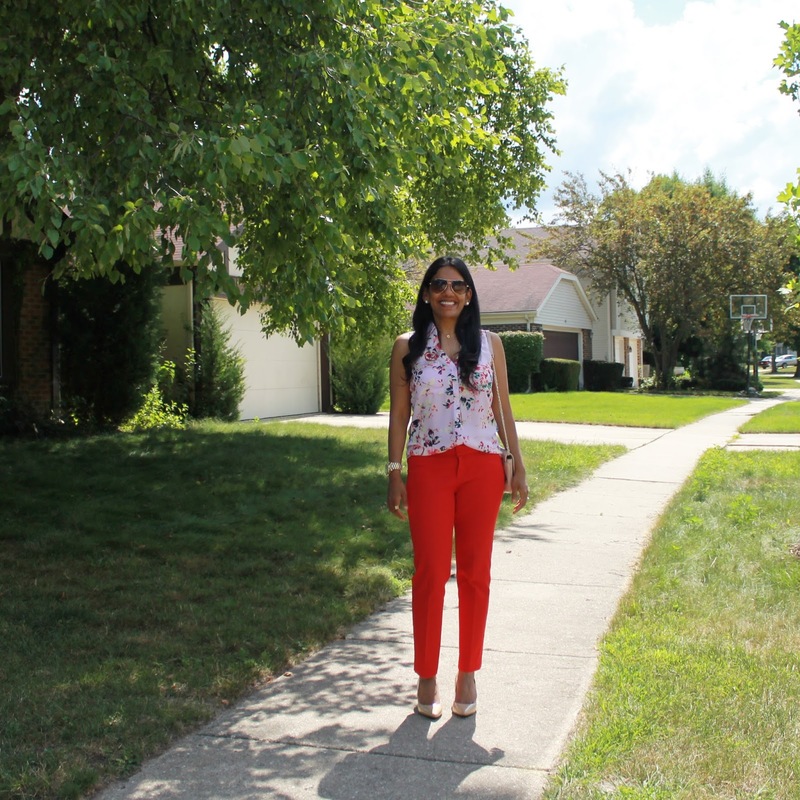 You probably won’t be surprised to learn that I like the term “capris” better than “cropped pants.” I can’t help it, to me the word “capris” conjure up an image of easy summertime chic à la Jackie in the 1970s, a look I never get tired of! 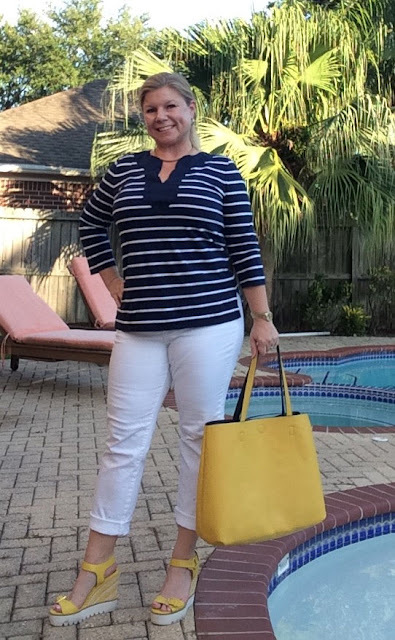 I’m wearing my trusty Old Navy white denim capris (so glad I bought a back-up pair), a striped shirt from Target, and my Anne Touraine Paris Silk Chiffon Stole that is easily my favorite summer scarf. 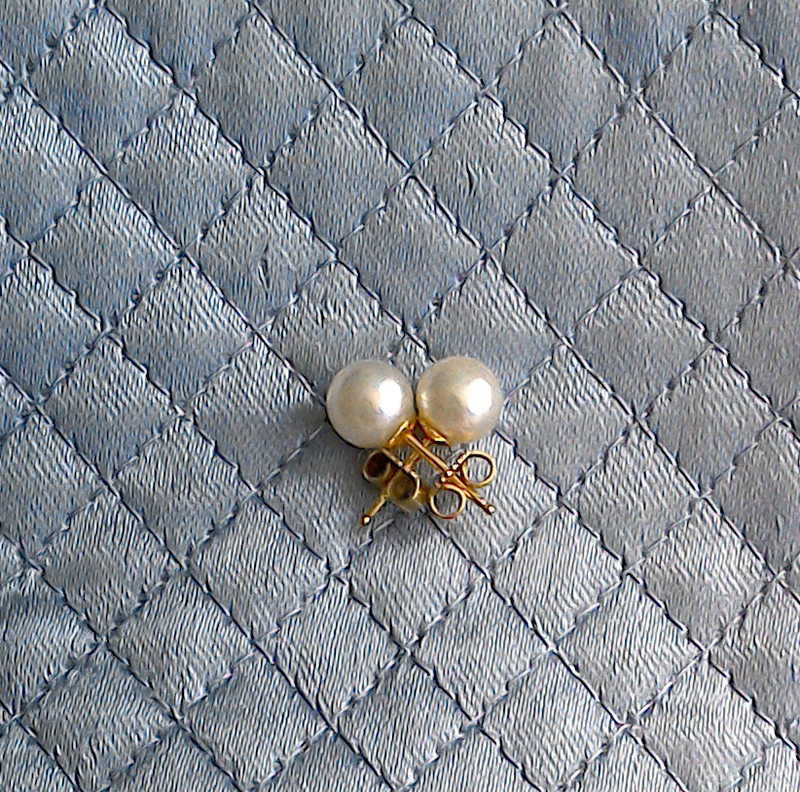 I love its light weight, the wonderful silk, and the gorgeous shade of blue! 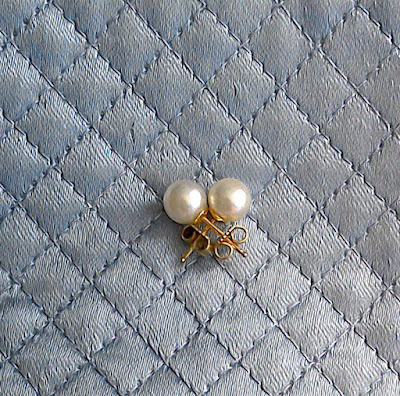 I am also wearing my favorite pearl earrings—studs in yellow gold from Mikimoto. I hope your cropped pants are keeping you cool during the Dog Days of Summer! For September, let’s celebrate yellow! From the sunflowers in bloom to the lemon sorbet that’s so refreshing on a hot day, yellow is a signature color of the waning days of summer, so style your favorite shade of that sunshine shade and join us for “How I Wear My: Yellow.” Send photos to us at howiwearmy@yahoo by September 12, 2016, and be sure to tell us a bit about your outfit. 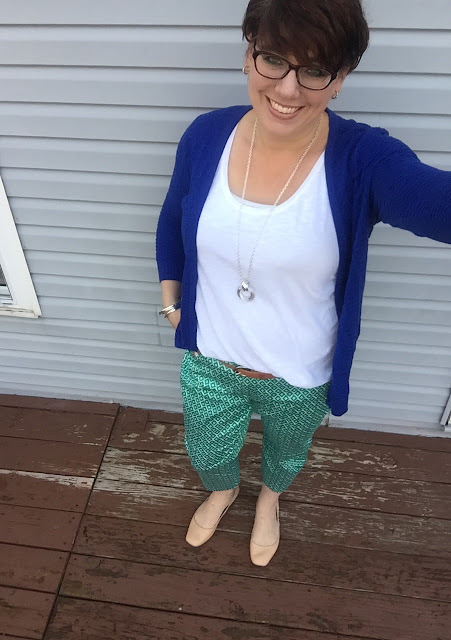 Do swing by Adrienne’s to see even more terrific looks featuring cropped pants. I love seeing everyone's take on cropped pants! And I love your white capris! How smart to buy a second pair! 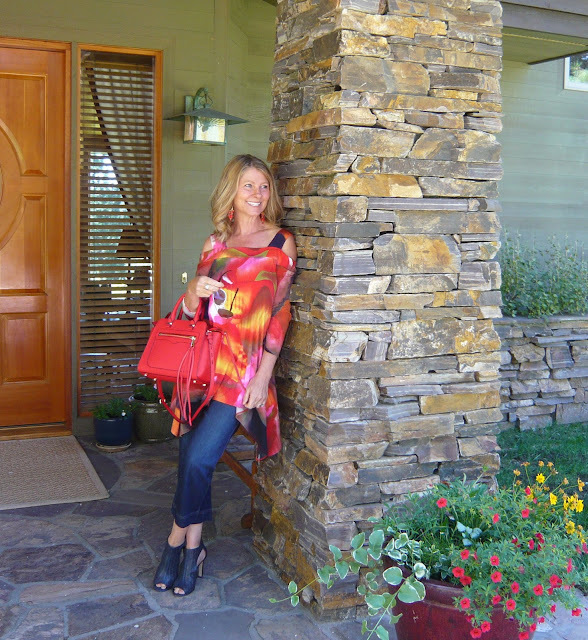 Your entire look is great - the perfect summer look with the striped tee and the beautiful scarf! Another lovely post my dear! I always so enjoy all of the style interpretations of your topics! And how fabulous do you look in your denim capris and stripes! A classic look perfectly executed!! I'm excited for your new topic for next month too! I have just been thinking I need to add some cheery yellow to my summer wardrobe! So this will be the perfect impetus to do so! All the very best to you my dear! Thank you once again for all your work that goes into these lovely and entertaining posts! I agree with you---the term cropped conjures up images of removing part of the pants---and for some reason strikes me as a negative! But "a rose by any other name", right? 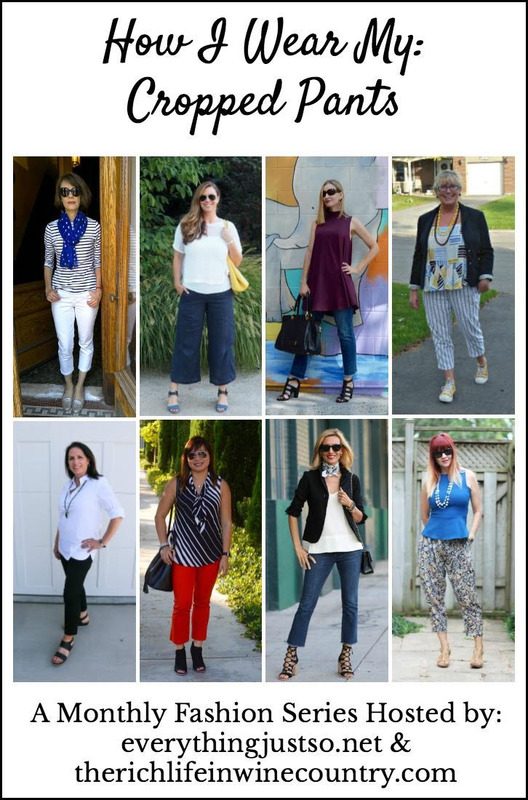 So many stylish looks this month - and many different types of cropped pants. I love your stripe/dot combo in blue. 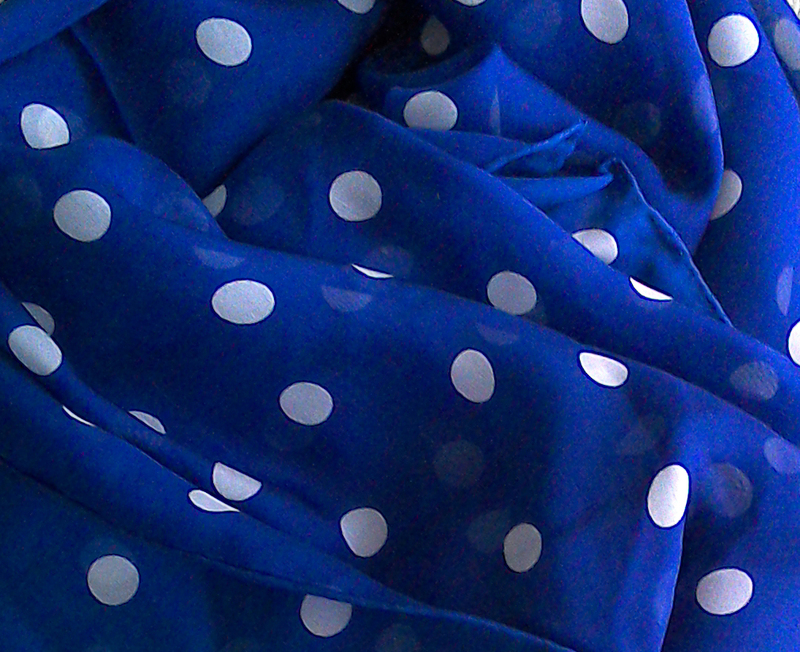 It made me realize I haven't worn my polka dot Anne Tourane scarf like yours in ages! Must bring that out this summer. Looking forward to YELLOW next month! Thanks for the hard work - can't believe we're coming up on 5 years of HIWM! I loving all these unique takes on the versatile cropped pants. I'm looking forward to how this group puts "Yellow" together next month. Thanks for including me. This is great fun! Love seeing everyone's looks as always. 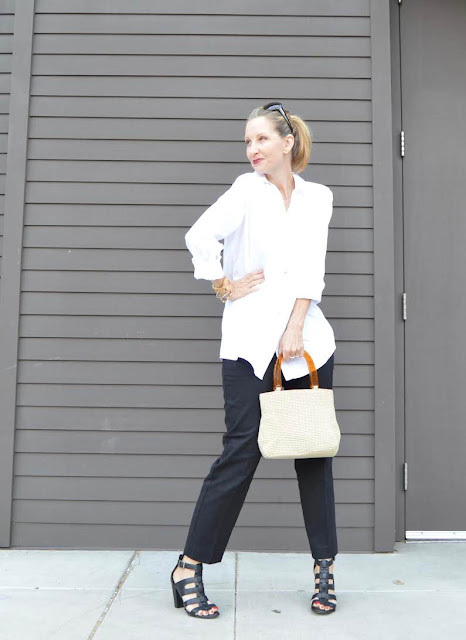 You look fab in your stripe tee and cropped denim, so very French! Thank you so much for putting it all together for us and I look forward to next month's looks. Everyone looks so fabulous and I'm inspired to try wearing my crops in all sorts of different ways. Thanks for another wonderful HIWM feature. Jill, you look the epitome of Summertime casual chic. You'd look totally at home sauntering around the Cote D'Azur in Southern France with your capris. Stripes and polka dots always make me smile - simple pattern mixing at it's best and the colour blue of the scarf is delightful. So many lovely variations from everyone. I so want to go on holiday now wearing my cropped pants! Um... yellow that's going to be a tricky one! I don't tend to wear much yellow - will have to get my thinking cap on. Looking good ladies. Looking good! Jill, I love the nautical look. I frequently wear a stripe tee and white capri's. Its so effortless in the warm weather & classic. Looking super chic, Jill! Thanks so much for hosting and I'm looking forward to the yellow theme! So many great looks. 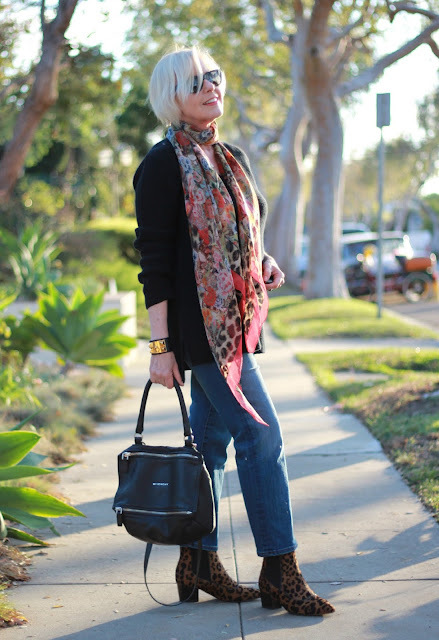 Love your scarf, thank you so much for hosting! There is always so much gorgeous inspiration in these posts! Thanks to you and Adrienne for doing this every month. I absolutely adore your scarf, Jill! It is absolutely stunning. Looking forward to seeing all the wonderful yellow styles next month! I am so behind, Jill...will be announcing why soon...but I really liked this group! Great styles here. Sorry I did not get anything sent in...but I really enjoyed looking at everyone's pics! 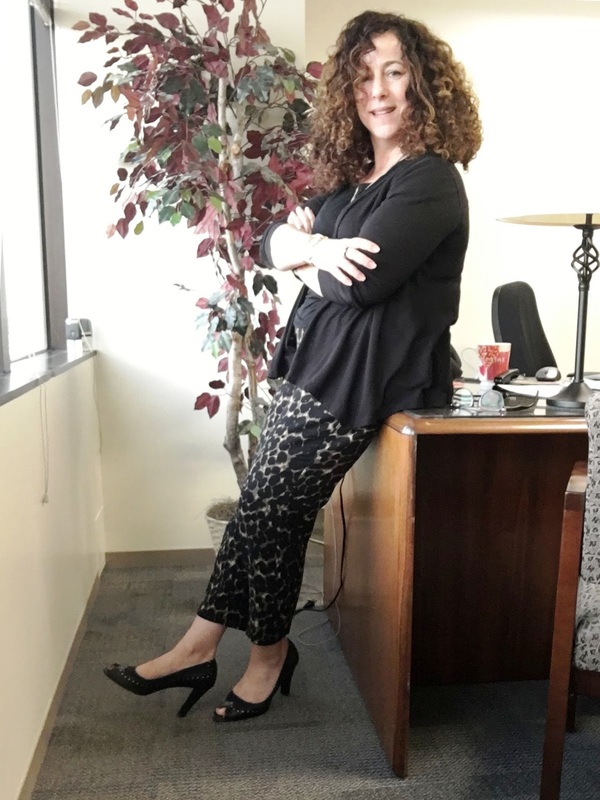 Jill thank you so much for the feature - I love that you too remembered the outfit clearly and that you added a photo of Lady Madonna herself...!